Life without art, life without love …is nothing. Another collaborative sketch between me and Scottish artist Sean Fleming, done while I was traveling. This one I’m now adding color to and will post another pic when it’s done. I love the push and pull of working together on a piece. Looking forward to doing more. 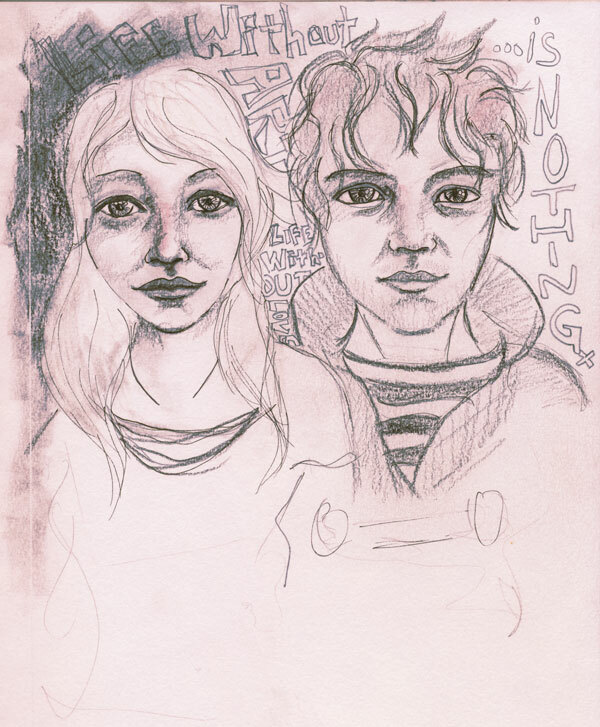 This entry was posted in General, Sketches and tagged art, collaborative art, couple, Drawing, Illustration, long distance relationship, love, pencil, sketch, Sketchbook by heatherunderground. Bookmark the permalink. To be able to collaborate with another artist and not dispute or be at odds…is a miracle (to me). Something I occasionally dream about. I am slightly to considerably miserable for much the reason you say. If I can’t create my art when it suits me…and if I can’t feel loved and love as I feel fit…this life…my life force leaves me. I am weak because my life lacks love. And, my art doesn’t feel safe where it is. I feel endangered. But, I am a creative spirit. A fruit tree doesn’t stop producing just because the soil isn’t ideal. It’s still programmed to produce something. As do I. I just hate to see my fruit mistreated or where it’s not respected. Hi. Thank you for sharing your experience. I always was a creative spirit as well, but completely suppressed my desire to live as an artist for a large portion of my life. And it did leave me torn up inside. Constantly filled with longing to be creating art, but denying it, lying to myself that it would be irresponsible to pursue, when not pursuing it was killing me. I also was relationship for many years that was not right for me, and it left me feeling very alone. I lived completely in my head as a result. Finally putting art first has freed me, though I know it will be a tough road, it feels right. I met my collaborator as a result of finally putting myself out in the world as an artist, and I agree, there are many I could not work together on a piece with… But he and I share the same brain sometimes it seems. We see things very eye to eye, and love each others work. In this regard, I do feel very lucky. It was a tumultuous path to get here though, and at times, didn’t look like I’d survive it. Stay strong. It’s nice meeting you. This is what infuriates me so much. My small branch of the family is creative, too, but they suppress it in their own ways…and express it in different ways. When I heard my dad gave up a ceramic business to work in a factory (of which allowed him to spend little time with me growing up other than fussing about him being too tired to play or share shows I liked), I was furious and determined to become a famous artist one day. I said I would not let my art go away the way my family let theirs. I’m still figuring out the fame part. I am mad art is disrespected in school other than as some “easy credit”…or, if you see it differently, art school. I suppose not everyone can find a lucrative art job these days…but I hear the outcry of the artist soul around the world. I see so many artists just on here. Imagine how many more don’t even use a computer. There’s a lot of artists and so little use/place for them. It’s almost maddening to be given this yearning and not have a comfortable and fitting place for it. It’s like having a handicap or being gay and unable to “come out of the closet.” I sometimes feel like a slave to my heart…or a drug addict. I agree entirely! It is maddening that a person can be born with such a yearning to make art that suppressing it can make it feel like you are living a lie. Trying to fit in in places where you don’t really belong or are misunderstood is miserable, trying to blend in is such an exhausting task… It’s so refreshing when I have the opportunity to be around like-minded people! I feel so energized and alive. I love being in a room with other people making art, even if we are all working on solitary projects, it’s such a good feeling. It is frustrating to see people give up on their creative passions. I’ve seen that in people close to me too. I am, right now, struggling with how I can make an income without letting art become a hobby… I know it would kill me, if that were to happen. Both losing art, and the having to fit in the “normal” world. I can’t go back to just longing for art… Fame would be awesome! I’d like to think that I can make it there someday. But for now, I’ll be happy if I can find ways to use my artistic passion for a paycheck. I don’t know what it’s like to be among like-minded people…and I am afraid my social anxiety would quickly alienate me if I was. I like to imagine the team at Pixar share this good feeling, but what do I really know other than the goody-goody video feeds put out? I dunno… I’m usually an introvert. I was extremely shy and uncomfortable in my younger years and still am in many settings. I think a lot of artists are, and are awkward in many social situations, but there is some empowering comfort with being around others who are the same. Defenses get lowered. I hope that you can experience that sometime in the future, if it is something you desire. I never labeled myself as an introvert or much of anything because some gene in me and my family branch claims to dislike labels when applied to ourselves. But, I can see how the label might fit me. My shyness and discomfort is in part because I destruct myself when I don’t actively try things. I am more adventurous with my diet than I am with my socializing. And, that makes me sad and mad at myself.